Langtang Trek Via Gosainkunda This trek starts after one-hour drive from the valley to the greenery and full of natural resources Sundarijal known as Shivapuri National Park, which is the starting point to reach the holy lake Gosaikunda. This is the holy route followed by the hindu people who goes to holy Lake Gosaikunda. A blend of beautiful and wilderness trek to Langtang with cultural trip experiencing the lifestyles and traditions of local ethnic groups. On the way you will pass through the Tamang and Sherpa villages, talking to and living with these ethnic, simple and hospitable people who will mark unforgettable memoirs in your diary. The trek upto the holy lake of “Gosainkunda”, Gosainkunda pass (4610m), requires a quick elevation of altitudes offering varied natural landscapes, flora and fauna. You can test the local Yak cheese. Arrival in Kathmandu Tribhuvan International Airport, a representative from Matterhorn Treks & Expedition will transfer to your hotel; we will brief about your trip activities. You’ll have rest of the day at leisure & Overnight at Hotel B/B. Sightseeing in some of landmarks that are the World Heritage Sites of Kathmandu Durbar Square, the sacred Hindu temple of (Pashupati Nath), the famous ‘Monkey Temple’ (Swayambhu Nath) and Buddhists shrine (Bouddha Nath). You can also make your last minute buying of personal items and preparation for the next day. Overnight at Hotel B/B. This day, we drive to sundarijal (1350 m.), a wide and obvious climbs up beside the enormous water pipe that supplies Kathmandu with drinking water from a reservoir inside Shivapuri National park. First stage of the trek climbs steeply to entry check post. Follow the sign posted trail uphill to the large Tamang village of Mulkharka. The trail continues to climb to reach the pass at Borlang Bhanjyang. The rest of day is the entire down hill through peaceful forests to Oak and rhododendron. Within the hour, you’ll reach a wide track running uphill to Chisapani. The mountains views are excellent from here. Overnight at lodge on Full board. As you leave Chisapani, the trail runs out of the village and continues level among pine plantations on the top of the spur. There are good mountain views as you leave the wide track and drop down into the valley on a muddy zigzagging path. The halfway down the slope, the trail reach the Brahman and chhetri village of Pati Bhanjyang (1770 m.). The trail heads north out of the pathi Bhanjayang, a gentle ascent to a small white chorten at the sherpa village of Thakuni Bhanjyang. 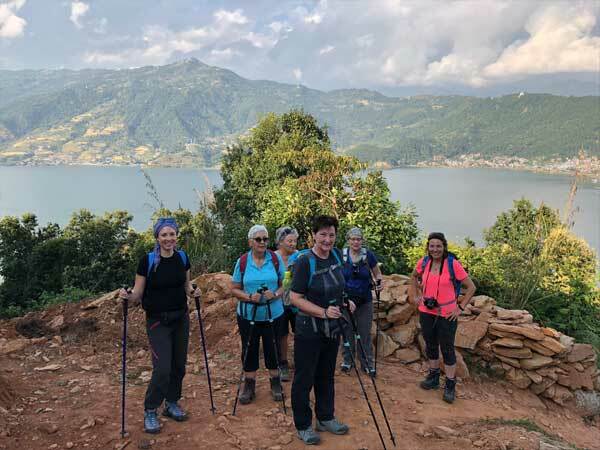 Climb steeply uphill past the lodge to meet a large trail, then bear right on crumbly stone steps to reach the much larger village of Chipling (2170 m.) and then we reach Lapcha Danda. If the sky is clear, you’ll have good views of the peaks as you drop down through rhododendron forest on the far side of the pass. After Thotong (thodang Betini, a friendly tamang village), the path drops for another 30 minutes to Tamang village of Golphu Bhanjyang. If it is clear morning, you can see good view of mountains. Overnight at lodge Full board. This is the most dramatic stage of the trek, with the views that become increasingly epic as the day goes on. However, the climb is steep and sustained. You’ll work up a sweat climbing the 1650 m to Tharepati and then face a sudden chill once you encounter the icy winds at the pass. Starting from Golkhu Bhanjyang, climb the hill to Kutumsang(2450 m). As you climb the Yurin Danda ridge, you see peaks above Langtang and Gosaikunda soar into view. About three hours after leaving Kutumsang, you’ll drop down to the appealing village of Magin Goth (Magen Goth). There are fabulous views from here to the rocky Thare Danda ridge, where a rugged trail climbs to Gosaikunda. After Magin Goth, it is a steep, two hours climb to reach the Tharepati village (3640 m.). A steep path raises above the village to a fluttering white prayer flag on a mind swept hilltop, offering a perfect panorama of the Langtang Himalaya. and then overnight at lodge Full board. Day 07: Phedi Trek to Gosaikund pass (4610 m) 5 hrs walk & Overnight Lodge in Gosaikund Full board. Day 08: Gosaikunda to Thulo Syabru 6 hours Overnight at lodge on full board. Day 09: Trek from Lama Hotel to Langtang village (3430 m.) via Ghore Tabela 6 hours. As you continue climbing there are occasional glimpses of Langtang Lirung between the trees. At Ghora Tabela [3000 m], the trail emerges from the forest. The trail continues to climb gently and the valley widens, passing a few temporary settlements used by herders who bring their livestock to graze in the high pastures during the summer months. There is a monastery, which you can visit shortly before arriving at the village of Langtang, the headquarters of the Langtang National Park. Stay overnight at lodge on full board. Day 10: Trek from Langtang Village to Kyangjin (3870 m) 3 hours. The trail climbs gradually through small villages and yak pastures as the valley opens out further and the views become more extensive. After crossing several small streams and moraines, the trail reaches the settlement at Kyangjin. You should arrive at Kyangjin by lunch time allowing time to acclimatize and explore the area. It is a dramatic setting, with snow-covered peaks surrounding you in all directions such as Langtang Lirung, Ganjala peak, Tserko ri, Langsisa ri and many others. Stay overnight at lodge on full board. Day 11: Rest day at Kyangjin Gompa and excursion in and around the area. You can visit the monastery and the cheese factory, walk up the moraine to see the spectacular ice faces and tumbling glaciers of Langtang Lirung or ascend Kyangjin Ri (4350 m.), directly behind the village, for a breathtaking panorama of the Langtang peaks. Stay overnight at lodge on full board. Day 12: Trek from Kyangjin Gompa to Lama Hotel (2470m.) 6 hours. From Kyangjin you retrace your route, following the Langtang Khola to Langtang village and on to Ghora Tabela. After lunch, you continue the steep descent to Lama Hotel. Stay overnight at lodge. Day 13: Lama Hotel to Syabru Bensi 4 hours walking. Trek back to Sybru Bensi. Overnight in Sybru Bensi at lodge on full board. This pleasant day you may have full day at leisure at your own or can be extends your extra trip with us on additional cost or time to explore the Thamel for last day shopping and evening Matterhorn Treks & Expedition will take you for Farewell dinner. Overnight at hotel B/B. 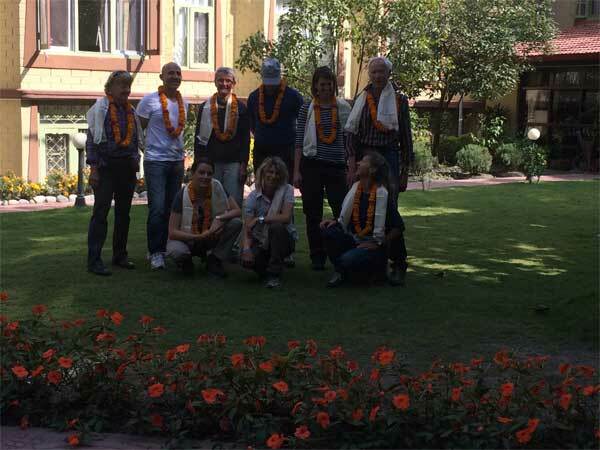 Day 16: Departure from Kathmandu.